← Up all night to get Lucky! At Salone del Mobile in Milan last week. The Maison Martin Margiela house was designed by street artist Cédric Bernadotte, entitled Residual Spaces. 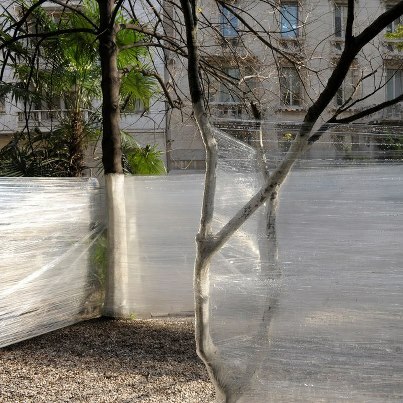 Living in the garden of MMM headquarters, a web of cellophane symbolizes the introduction of the brand concepts of ”spontaneity and artisanal into an urban setting,” by giving function to non-traditional spaces. Bernadotte’s work uses the pre-existing urban landscape as a base material for home/decor, showing that we can ultimately reside wherever we choose.